During the 17th and 18th centuries, many “freethinking” Europeans embraced Deism, a theology that subjected religious truth to the authority of human reason. In colonial America, Deism found few adherents, but those who were attracted to it tended to be wealthy and educated, leaders in colonial society and politics. Today, debate swirls around the role Deism played in the founding of the nation. What was this “religion of nature”? How can we explain it to students? Who among the Founders were Deists? What influence did Deism have on the culture of the new nation? “Deism and the Founding of the United States,” Darren Staloff. Divining America, TeacherServe©. National Humanities Center. A View of Religions in Two Parts, Hannah Adams, 1801, excerpts. Age of Reason, Thomas Paine, 1794, excerpts. The Autobiography of Benjamin Franklin, 1791, excerpts. Chapter 17,The Life and Morals of Jesus of Nazareth, Thomas Jefferson, 1820. The Declaration of Independence, 1776. An Act for Establishing Religious Freedom, Passed in the Assembly of Virginia, 1786. Great Seals of the United States, proposed by Franklin and Jefferson (1776), and Thomson (1782), U.S. Department of State. Poem relating the Beadle murders followed by an account from the Connecticut Courant, December 17, 1782. 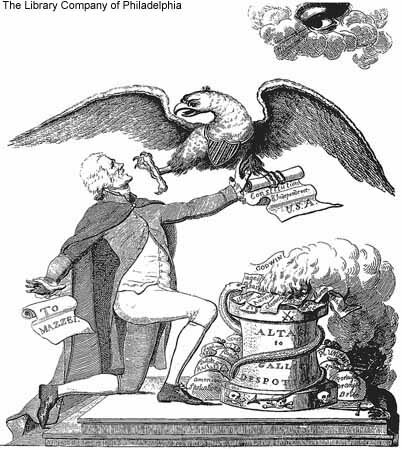 “The Providential Detection,” political cartoon, 1800. Christopher Grasso, “Deist Monster: On Religious Common Sense in the Wake of the American Revolution,” Journal of American History 95 (2008): 43-68.